Check These Out: Photos from Fantastic Fest's 'Buried' Stunt! Another post about Buried? Yes, but Lionsgate is really kicking up their marketing in these last few weeks before its opening and there is some cool stuff that I need to feature. 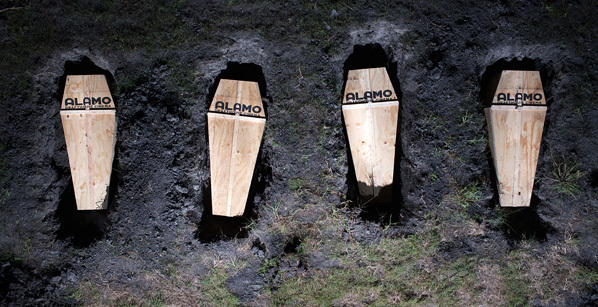 A few weeks ago, we talked about an event/stunt that the Alamo Drafthouse was planning for Fantastic Fest called "Buried with Buried" where four fans would be buried alive in coffins and shown the movie while buried. The event took place over the weekend and we were just sent two photos of the setup and it looks badass. This is awesome, I'm a bit sad I didn't get chosen, as I would've loved to participate in this. Talk about an unforgettable way to see a movie! Here's exactly what went down. The four fans were chosen on the Facebook page. After signing waivers, the participants were blindfolded and had burlap sacks placed over their heads. They were driven in silence to a location 30 minutes outside of Austin. Only after they had been placed inside their coffins were they allowed to remove the blindfolds. 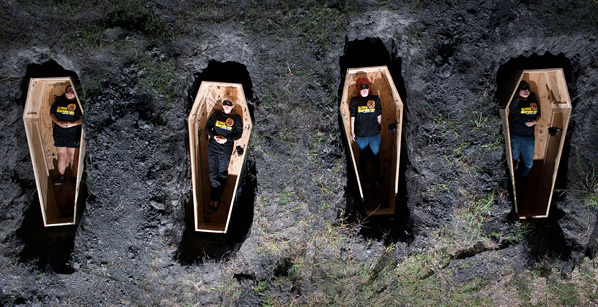 Inside the custom-built coffins they watched Buried on LCD monitors fixed to the coffin lid. Each of them made it through (relatively) unscathed and will get to meet Ryan Reynolds at the gala event for surviving the experience. "Relatively?" Uh, I wonder what that means? Pretty cool or what? someone's gonna sue! I love the marketing. haaaa yeah, hot coffee lost McDonalds millions, and there putting people in coffins as a marketing stunt.........see where Im going? holy crap, I wonder how you wouldn't go crazy inside of that coffin. Though, it does look roomy for a coffin. regardless, creepy as hell! and awesome!